Agriculture is one of the most hazardous industries in the United States with a death rate of 21.3 per 100,000 workers and approximately 130,000 disabling injuries. The toll is huge with respect to the communities involved and national productivity of our food supply. The death and injury rates do not include victims who are not occupationally active in agriculture but died from an incident involving farm and ranch equipment. The most common place to be involved in an incident with farm and ranch equipment is on the public roadway system. For this reason, the National Safety Council is targeting rural roadway safety during the National Farm Safety and Health Week. There are three general types of users of the rural public roadway system: farmers, the general public, and persons who use the roads for their exercise programs. This fact sheet will target farmers who use the rural public roadway system. Farmers know the limitations of their machinery. What they don't always realize is the general public is not familiar with what their machines can and cannot do. This is especially important when a tractor, is traveling by itself or when it is towing an agricultural machine. Also, self-propelled machines, such as sprayers, combines and other harvesting equipment travel on public roadways, as well. These machines have limited speed and maneuverability. Tractors and self-propelled machines generally can travel no faster than 25 miles per hour. Machines with this speed limitation are identified to motorists on the road with a Slow-Moving Vehicle (SMV) Emblem. SMV emblems have changed over the years. The newer emblems are identified by a label that signifies that it meets the requirements for the ASAE standard S276.5 MAY98. The SMV emblem has a central fluorescent orange triangle. The orange triangle was designed to be eye-catching during daylight hours. The orange triangle is bordered by red strips of retro reflective tape. The red retroreflective strips are visible as a hollow red triangle when illuminated by lawful low beam headlights up to 600 feet (See Photos 1 and 2). 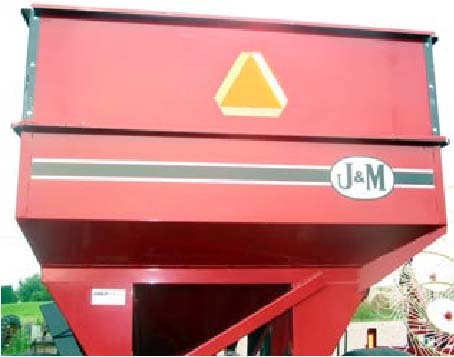 To increase the visibility of agricultural machinery traveling on public roadways, extremity marking is essential. Red retroreflective tape should be placed on the rear of the machine and amber retroreflective tape should be placed on the sides near the front and rear quarters with more amber tape in the middle. In addition to the use of retroreflective tape, red and amber lights may be required for towed machines over 12 feet wide. 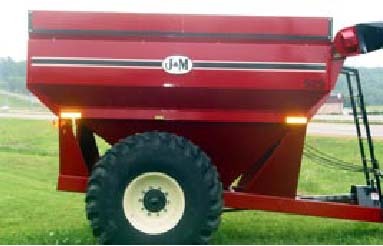 Tractors and self-propelled machines are required to have both amber and red lights to the rear. The amber lights should be visible to the front and rear and should flash as a four-way warning to other motorists (See Photo 3). White lights tell other motorists that some vehicle is coming toward them. Only headlights should be on when traveling on roadways. Working lights should be turned off. A good recommendation is to utilize a pilot vehicle behind tractors and machines. In cases where the machine is relatively wide and may encroach the opposing lane, then another pilot vehicle traveling in front adds to the possibility of eliminating a crash. In addition to marking by retroreflective tape, SMV emblems, and lighting, mirrors should be utilized. 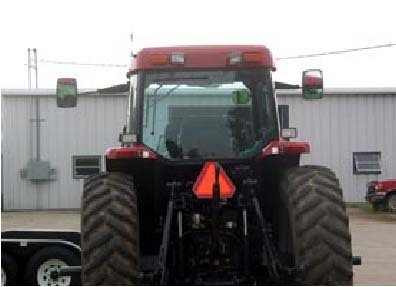 Having mirrors that are properly adjusted will enable the operator to monitor traffic and view how the towed machinery is traveling It is essential to know at all times what is happening around you when operating tractors and other machinery. The mirrors should extend beyond the sides of any towed or self-propelled machine to provide optimum visibility. There is a crucial time for an operator to know his/her surroundings, especially when a left turn needs to be initiated. Turning at roadway speeds is not advisable, therefore speeds must be reduced. An operator of a large machine that plans to turn left must first move the machine to the right to clear any driveways and gates that would be encountered by trailing equipment during the left turn. Any motorist traveling behind the farm machine may think that you are letting them pass (even if it is in a no-passing zone). If the machine operator is not aware of the situation and completes the left turn--a collision may result. Agricultural machinery is very large and heavy. An automobile is very likely to be extensively damaged, along with severe injury to its occupant(s). Sharing the road is everyone's responsibility and being proactive about preventing possible incidents that could result in injury is just plain smart. Photo 1: A properly placed SMV emblem that is clean, bright, and not obstructed. The red-orange fluorescent equilateral triangle should be the most obvious feature of the emblem. Photo 2: When illuminated with low beam headlights SMV emblems should be seen as a hollow bright red triangle. At night the triangle should be visible at 600 feet. Photo 3: This combine shows a good SMV, amber and red retroreflective tape, and red and amber lights. Not visible are headlights. The working lights should not be used when traveling on public roadways. 1) Use SMV emblems that meet the ASAE S276.5 Standard. 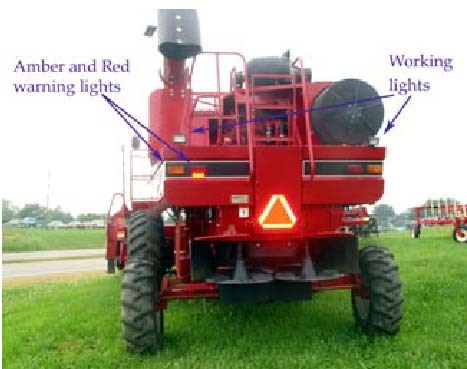 2) Use red retroreflective tape to the rear of tractors and machines. 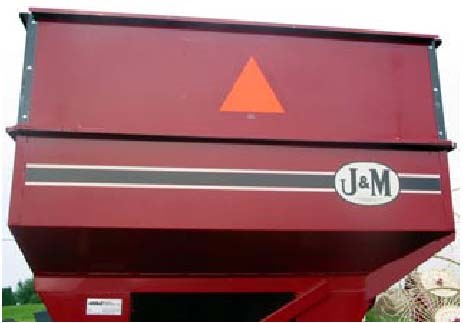 3) Use amber retroreflective tape on the sides of agricultural machines. 4) Use warning red and amber lights. Patience is a trait that will allow everyone to go home at the end of the day.